Make a black lace fit and flare dress your outfit choice to look truly gorgeous. When it comes to shoes, this outfit pairs wonderfully with Charles by Charles David silver leather pumps. If you're on the hunt for a casual yet incredibly chic outfit, reach for a white dress shirt and a light blue ripped denim pencil skirt. Both of these pieces are totally comfy and will look great paired together. Bump up the cool of your look by completing it with Charles by Charles David silver leather pumps. If you're on the hunt for a casual yet chic look, reach for a white crew-neck sweater and white skinny jeans. These two items are very comfortable and they also look great when paired together. Sporting a pair of Charles by Charles David Kadie Pump from Nordstrom is a simple way to add some flair to your outfit. If you're on the lookout for a casual yet totaly chic getup, team a yellow coat with blue skinny jeans. Both pieces are super comfy and look great paired together. Look at how well this look is rounded off with silver leather pumps. If you're on the hunt for a casual yet seriously stylish ensemble, go for a black cropped sweater and a black full skirt. Both of these pieces are very comfy and they also look stunning when worn together. Wearing a pair of Charles by Charles David Kadie Pump is a simple way to add some flair to your getup. If you're after a casual yet seriously chic outfit, opt for a white crew-neck t-shirt and a beige chiffon midi skirt. As well as totally comfortable, both of these pieces look great together. Bump up the cool of your outfit by complementing it with Charles by Charles David Kadie Pump. For a smart casual getup, rock a light blue blazer with a pink lace pencil skirt — these two items the place of work really nice together. Charles by Charles David Kadie Pump are a fitting choice here. If you're scouting for a casual yet chic look, pair a navy double breasted blazer with blue boyfriend jeans. As well as totally comfortable, both pieces look great paired together. 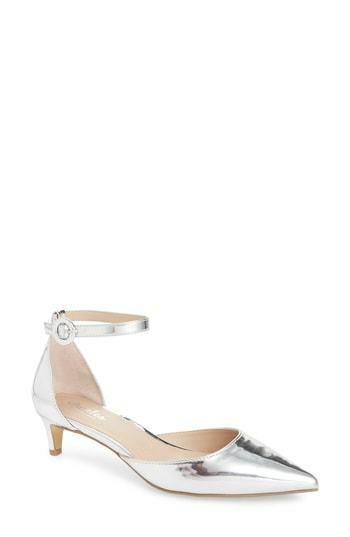 Silver leather pumps will bring a classic aesthetic to the ensemble. If you're on the lookout for a casual yet stylish ensemble, go for an olive parka and navy skinny jeans. These items are super comfy and will look great paired together. Let's make a bit more effort now and throw in a pair of silver leather pumps.